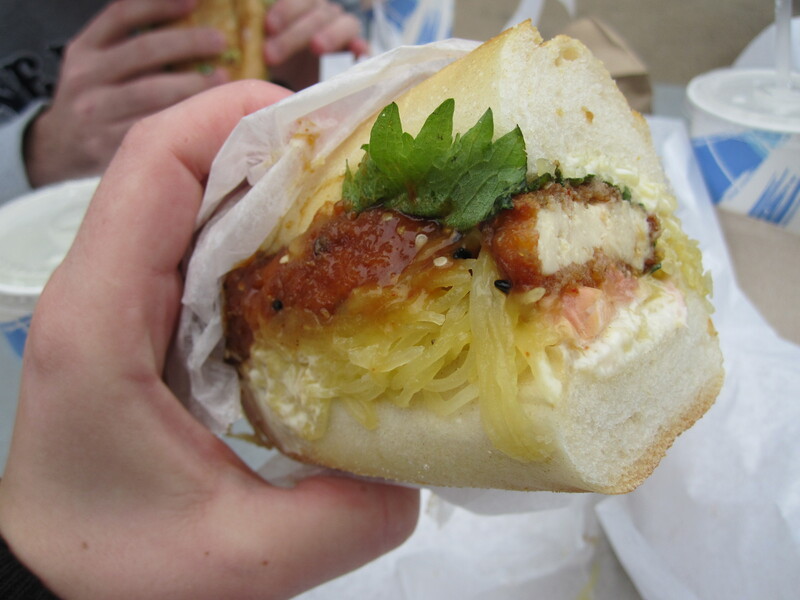 When I did a little research into the latest and greatest in NYC sandwich culture, a sammy shop called No. 7 Sub popped up quite a few times. Located in Flatiron (B’way btwn 28th/29th Sts) and situated in the ground floor of the Ace Hotel (though there’s no direct access between the 2, as far as I could tell), I made a mental note to add this spot to my to-do list. Seeing as they’re only open for lunch Mon-Sat from 11:30am-5pm (or until they run out of bread for the day), I decided the buzz on this place warranted skipping Saturday brunch in lieu of a rocking good sub-day. No. 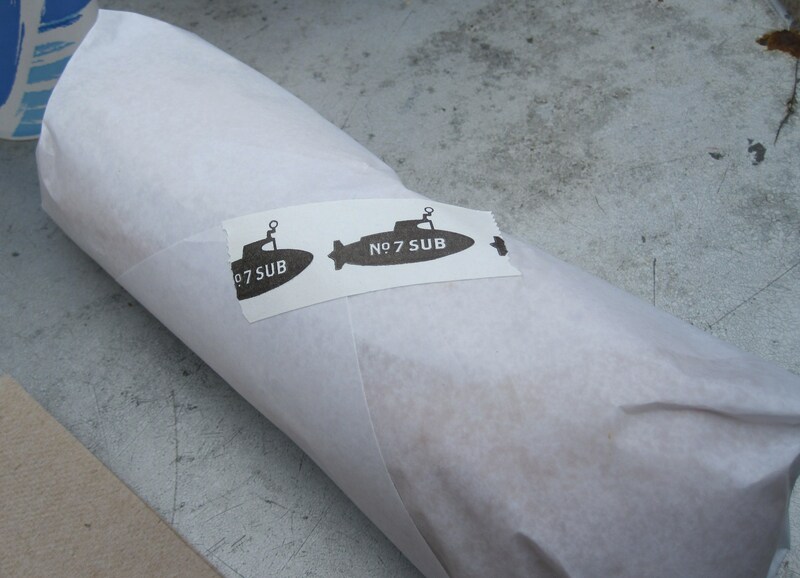 7 Sub is an offshoot of the No. 7 Restaurant in Fort Greene, BK – the sub spot has a quirky yet swanktified vibe about it, stealing a page out of the Ace Hotel book. Head in and order any of the subs (all $9 bucks), take the 5 strides necessary to cover the width of the resto, and hang while they freshly prepare one of their amazing innovations made just for you. I was really torn between a few of the options but I had the insane pleasure of grubbing on the General Tso’s Tofu Sub. Breaded and fried, the tofu is so flavorful that it would be amazing by itself; throw in pickled ginger, shisho (a minty Japanese herb), spaghetti squash, and what I think was spicy mayo – full on party in my mouth. Seriously, may have been the best sandwich I’ve ever had (aggressive call, I know). 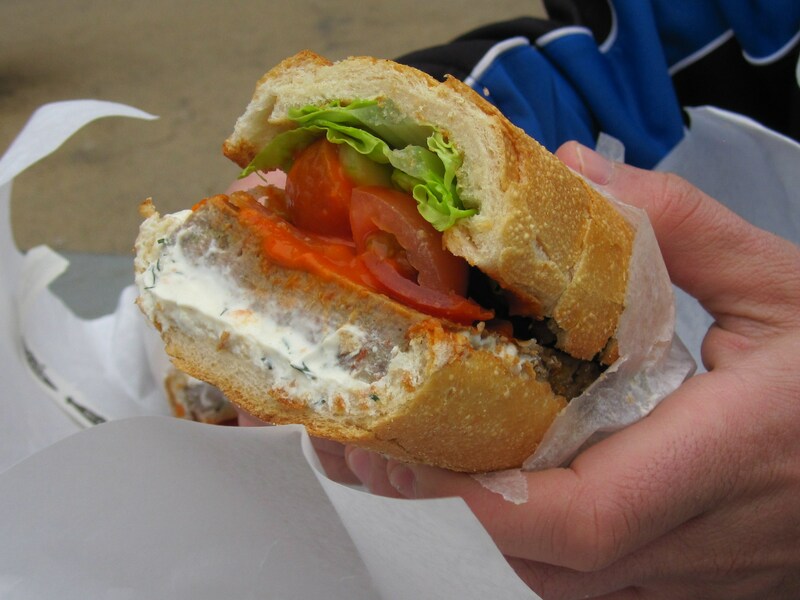 The gents I dined with had the Lamb Meatloaf Club which was smothered in white sauce (possibly tzatziki? ), a red sauce that was currified and topped with salad – finally got to hear how amazing it was during the brief halftime break. Additionally, the Cilantro Chicken Sub with avocado and feta was greatly enjoyed. For my next visit (which I’m obvi already planning), the Brussels Sprouts Reuben needs to happen – a friend who’s a veggie skeptic said it was damn good. For lunching perfection, walk your eats the few blocks down Broadway and sit at one of the tables just outside Madison Square Park; take a minute to fully relish your sub. These sandwiches are unique creations best savored (if you can manage to pause from bite to delicious bite).